The gold price today (Friday, May 6) is set to close the week on a high note. As of 9:30 a.m., prices are up 1.3% to $1,289. Despite some volatility, the gold price crossed an important mark this week. Gold prices touched $1,300 not once, but twice this past week. It's safe to say anyone who thought gold's bull market was over should rethink their positions. That's not to say gold prices won't see a slight retreat in the short term. In fact, a slight pullback is healthy behavior in a bull market, and we may be entering such a period right now. 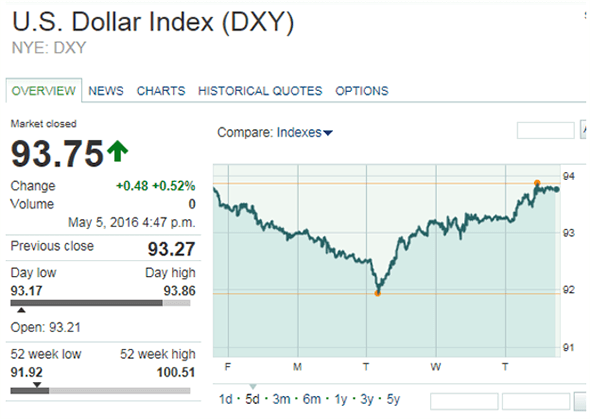 The U.S. Dollar Index seems to be on a bit of a relief rally this week. If that continues, we may face a bit more weakness in the price of gold before bullish action resumes, especially after touching the $1,300 level and being unable to break through it. Meanwhile, one of the greatest investors of all time – and no, it's not Warren Buffett – recently gave a bullish signal for gold prices by saying gold is his largest currency allocation. Gold prices kicked off the week with a slight loss. On Monday, May 2, prices surged toward the psychologically important $1,300 level but couldn't hold those gains. 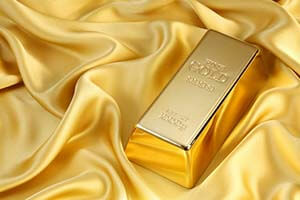 The gold price ultimately fell 0.1% to close at $1,291. Not coincidentally, the first two days of the week were marked by weakness in the dollar. That was when the U.S. Dollar Index (DXY) broke down through 93 and even dropped temporarily below 92 by Tuesday. Dollar weakness helped boost the gold price to $1,300 again early on Tuesday. But the DXY reversed and shot back up a full 100 basis points by later that day. Gold prices felt pressure from the dollar's rebound and tumbled 0.4% to close at $1,286. This gold price weakness followed through into the next two days. On Wednesday, May 4, the dollar maintained strength and sent the price of gold down 0.5% to $1,279. The metal sang the same tune on Thursday as gold prices fell 0.2% to $1,277. Despite a slight rebound in the gold price today to $1,289, the dollar could still push higher in the coming weeks. The biggest factor fueling the dollar is hawkish comments from U.S. Federal Reserve officials. This past week, Atlanta Fed President Dennis Lockhart and San Francisco Fed President John Williams both said a June rate hike may still happen. Their comments' effect on the dollar weighed on gold and caused it to retreat from the $1,300 level. But I don't expect weakness to last too long. Interestingly, Kenneth Rogoff – the IMF's former chief economist and current economics professor at Harvard – suggested emerging economies should lift their reserves of gold to 10%. He said emerging markets would see more benefits from owning gold rather than the sovereign bonds of developed economies. His reasoning behind boosting gold ownership was that gold – contrary to high-quality sovereign debt – has no upper limit on its price. Additionally, billionaire investor Stanley Druckenmiller made a stance on gold this week. 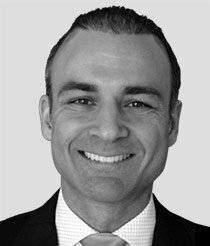 At this week's Sohn Investment Conference, he said gold is his largest currency allocation. He also told the audience to exit the stock market and buy gold because the Fed has borrowed "more from future consumption than ever before." That sounds to me like a bullish indicator for gold prices – and a resounding validation for the "eternal money."